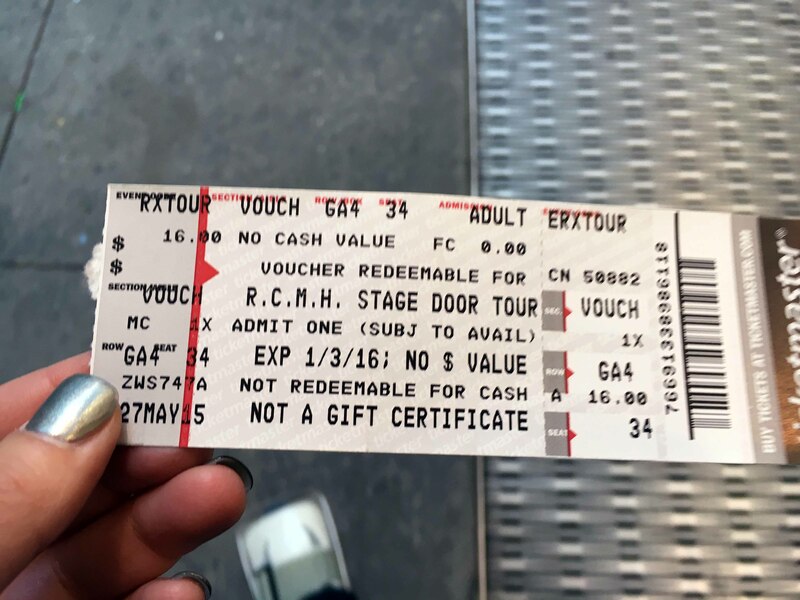 To say we were disappointed in this Stage Door tour is an understatement. We were all crowded into a small room looking down on the theater itself through a glass window. 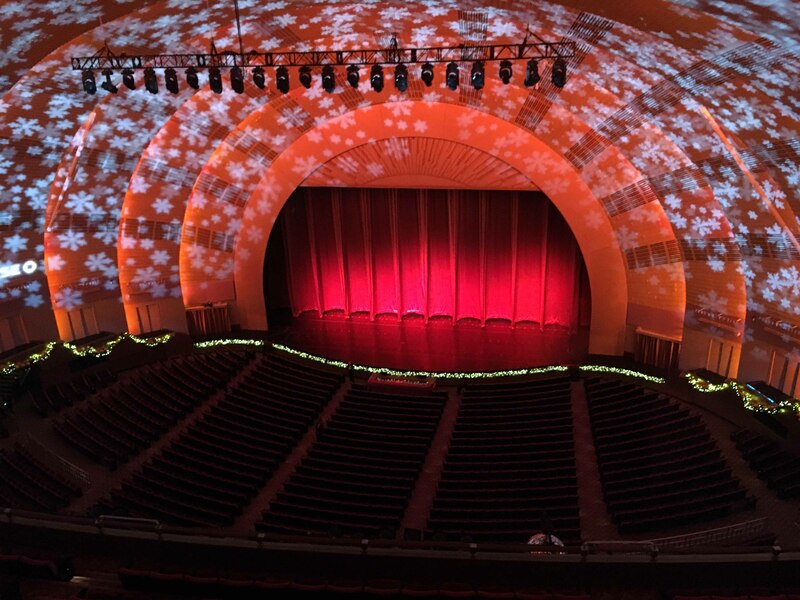 The Great Stage is framed by a huge proscenium arch that measures 60 feet high and 100 feet wide. 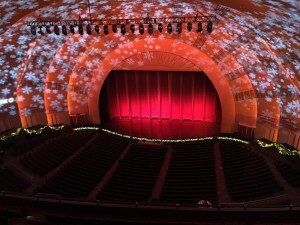 A vast new gold-threaded curtain for the 144-foot-wide stage is was embedded with fiber-optic lighting that generate a rainbow of changing colors and patterns. 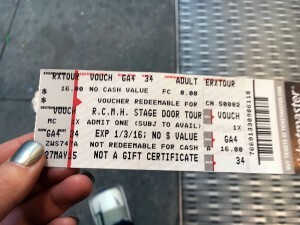 The state-of-the-art stage has four hydraulic elevators to carry performers and musicians either below or above the stage, a three-section turntable, and measures a full city block wide. The orchestra and two organs can be moved behind the walls or under the floor without interrupting the orchestraâ€™s playing. We traveled through many small hallways, looking at old posters and pictures of people who once performed here. We were lead into a little theater to watch a short film clip. 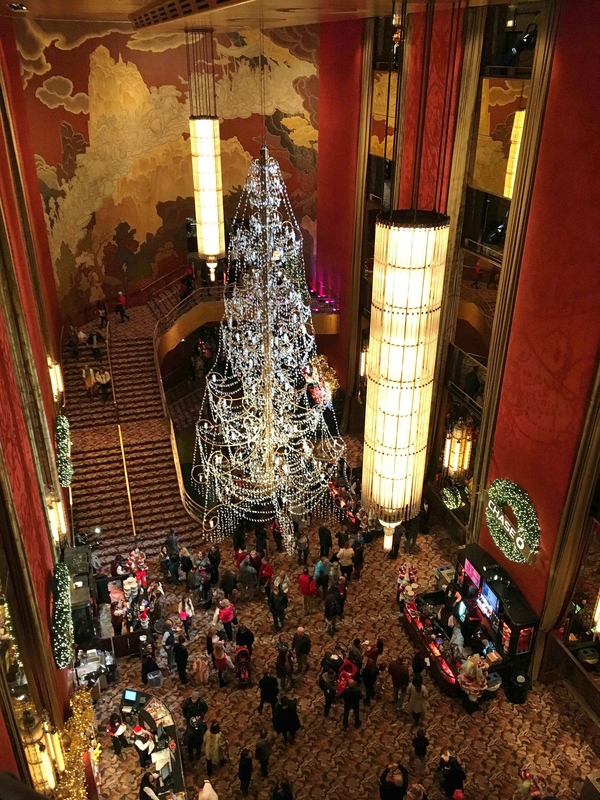 Afterwards we looked down into the main lobby, also known as the â€œGrand Foyer,â€ which is 60 feet tall and covered in gold-leafed wallpaper. The chandeliers in the lobby are considered to be the largest in the world, each weighing 2 tons, and can be lowered for cleaning simply by pushing a button. 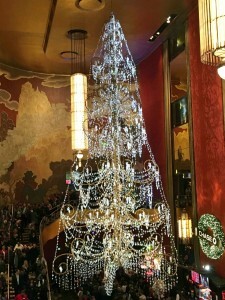 It takes a six-person work crew eight hours to clean one chandelier. After this we were sent into a very small room to have our picture taken with a Rockette. Since we had tickets to see the show at 5, we left the group and headed down stairs to our seats. We missed the Q & A with her. 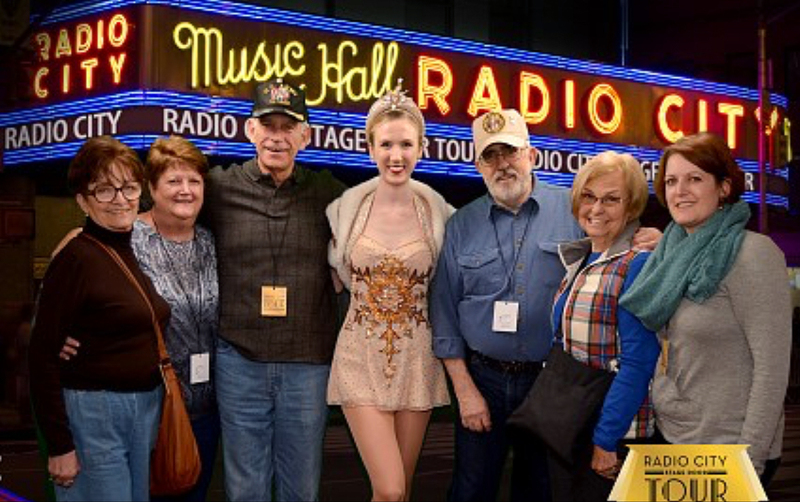 There was 20 minutes left in the tour, the others in our group were waiting to have their picture taken with the Rockette, so not sure we missed much. 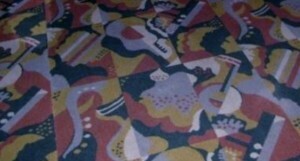 Various instruments are depicted in the Radio City Music Hall’s specially designed carpet. 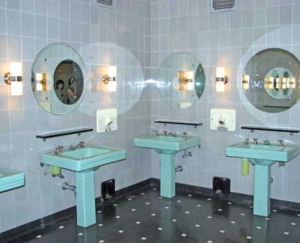 The fixtures are originals in the historical art deco women’s downstairs lounge and have foot-pedal operated electric hand dryers. 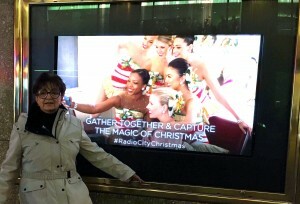 Here Lupe is in front of one of large signs, on the outside of the hall, advertising the Rockettes.